The other day, walking down the street near my apartment in the Lower East Side, I came upon a trailer park, right on the corner of Stanton and Suffolk, which hadn’t been there before. By trailer park I mean a trailer, parked. Not an expansive terrain of trailers. But also, inside the tiny, silver Coachman Travel Trailer was a park — yes, growing plants, shrubs, and trees, a miniature cascading waterfall and pond, wood and concrete benches, and skylights to let in sunshine. I stepped in, and enjoyed the natural park setting, the sound of trickling water, the dappled sunlight on the outstretched plant leaves. Originally commissioned in 2006 for an exhibit at the Storefront for Art and Architecture, Kim Hollerman’s Trailer Park is not new. It’s been written about before, and some of our readers may have seen it when it first exhibited (parked?) back in ’06. But for me, it was a fresh slice of genius on a sunny fall day. 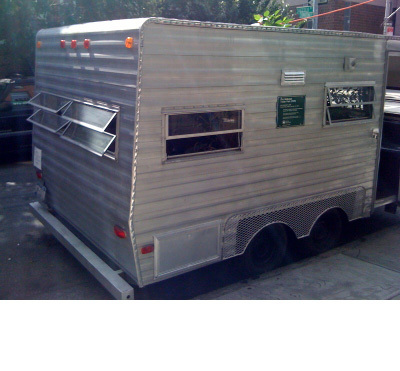 Currently parked at NY Studio Gallery, 154 Stanton Street.